Beauty is something that tends to capture your heart. There are numerous people who claim to be always keeping an eye open for beauty in life but in all honesty, one doesn't need to look for it. It commands attention to itself, demanding your eyes to open wide with awe and your lips to curl up in pleasure at the sight beholding your eyes. Needless to say, beauty doesn't have to confined to our vision. Beauty comes in all forms and senses such as in reading poetry, listening to music and even eating chocolate. I love how the wise Khalil Gibran phrases it so eloquently, "Beauty is not in the face, beauty is a light in the heart." Nature reigns as a Majestic Queen when it comes to beauty of any form. It has hence been a source of inspiration to countless artists, poets, writers and more throughout the linear course of time. 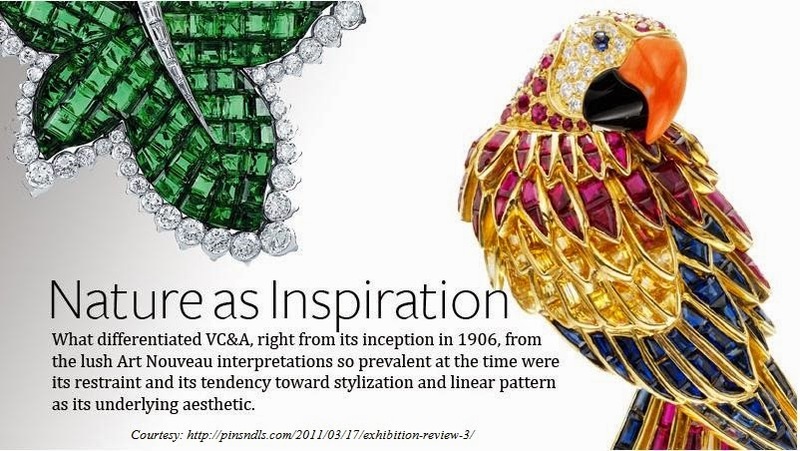 One such company that counts Nature as its muse is Van Cleef & Arpels. This company is said to be founded on the basis of love between Alfred Van Cleef and his wife Estelle Arpels after their marriage in 1895. Alfred Van Cleef came from a family of stone cutters and his wife belonged to a family of precious stone dealers. Using their combined family history and experience in jewellery making, Van Cleef and Arpels came into being. 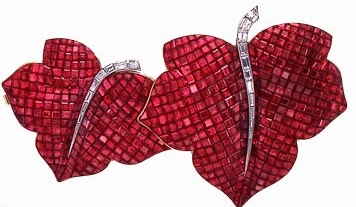 The first boutique was opened in Paris, France in 1906 as a venture between Alfred Van Cleef and his brothers in law. The company was handled by the following generations till it was bought by luxury Swiss company Compagnie Financière Richemont SA in 1999. I absolutely adore how poetic, whimsical and artistic the above composition. The world needs more advertisements like this. Now would be an adequate time to add that I have not been endorsed to write this review. I just find some of their pieces and work magical. Though I am not one who would include butterflies or fairies as part of my jewellery, I do have intense admiration for the exquisite craftsmanship that goes into some of their pieces, especially when using the 'Mystery Setting'. 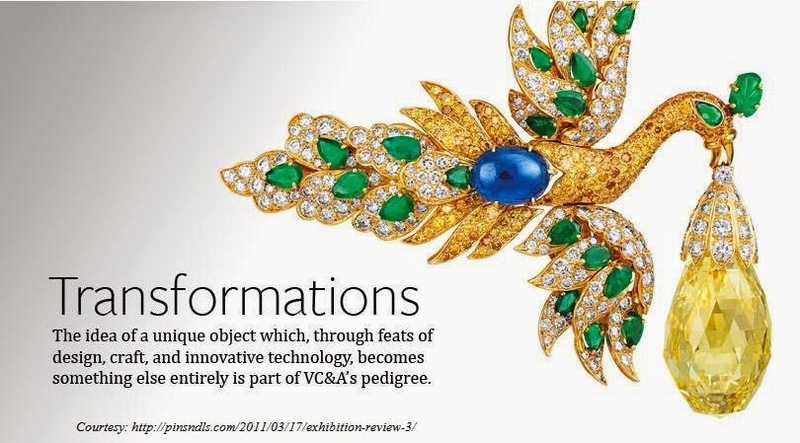 The 'Mystery Setting' is a technique that was patented in 1933 by Van Cleef and Arpels where the precious gems are invisibly set, as if a part of the piece of jewellery itself, with no visible prongs or bars. This technique requires around 300 hours of manual work per piece and adds a wow factor that few other jewellery makers can compete with. 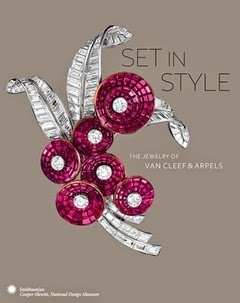 Van Cleef and Arpels mostly deals with jewellery, watches and perfumes. I am not aware of the perfumes to write much about them. I do love some of their jewellery pieces, and I have included the pictures of those pieces in this blog piece, such as the Ruby and Diamond earrings below. Their most recognized symbol would be the 'Alhambra', which again is inspired by Nature. The Alhambra is said to be the symbol of 'Good luck' and hence is the shape and form of a four leaf clover. The company launched the Alhambra in 1968 and it has since retained its basic four leaved clover curvature and form yet has been breathed new life into again and again in form of embellishments and multiple gem settings. My favorite piece has to be their iconic 'Zip Necklace' seen in the video below, which doubles as a bracelet and it holds just the right balance of beautiful and clever in its multiple usage application. With such ingenious mastery of technique, design and beauty, it is no surprise that Van Cleef and Arpels is the choice of royalty, movie stars and many others. It appeals both to the rich and not so rich random people around the globe who have an appreciation for beauty because it uses as its muse the epitome of beauty and that is free for everyone to access, our very own Mother Nature.